"fdisk" command does not exist on pogoplug-pro; how do you install it? got it working now; u gotta use "/sbin/fdisk /dev/sda"
Thanks for the feedback. I'll update the tutorial. This is the ip address to the pogoplug? This is the ip address to your desktop computer? This WiFi_Check script seems to work very well. But I feel it is a work-around, not a solution. The problem is that the Pogoplug disconnects from Wifi. This doesnt keep it from disconnecting, It just makes it reconnect within a couple minutes of being disconnected. My question is, why is the WiFi disconnecting? and is there a way to make it stay connected? Might be your router dropping u, or weak signal. Else bad pogoplug. Is been find for me tho. The script is not a workaround for your problems. Is for when the wifi is actually down. I thought that too, but it's 10 feet from my router (Asus RT-N65U) in the same room, and I had no issues when I used the my.pogoplug service to manage with wireless. I also experienced this exact same issue with my Pogoplug V4, with the edimax wifi adapter (and 3 other wifi adapters with the same chipset). I believe it is something in the system, or possibly the network configuration. The Pogoplug was rebooted 2 days ago, So it appears to have restarted the wifi 31 times in that two days? I don't think "Tx excessive retries" means that. I use my Pogoplug Pro (P02) for a NAS with Rsync cron. I have a USB Flash drive with the rootfs plugged into the top back USB port, and two 1TB hard drives which store my info and are synced in the two usb ports below. If I reboot with the hard drives plugged in, it wont boot to the rootfs, but the light will be green. but when I pull them out, it boots to the rootfs. is it trying to boot the rootfs from the hard drives? How can I have it boot and mount everything properly? Is this something we can utilize in this tutorial? You just need to update the uboot env to include the partition label. Hello Gurus, I followed this blog to install Debian on my Pogo Pro WIFi but stuck with USB boot issue. it works fine with front USB boot but if i can't more than one USB drive, the device is not booting. "mkinitcpio -v -g /boot/kernel.img" >> -bash: mkinitcpio: command not found. Looks like fix is to run "pacman -Sy uboot-mkimage" but it is not valid command for Debian. Can someone guide me with this command or procedure. You can install OpenMediaVault on the Pogoplug Pro / V3 running bodhi's 3.18.5 rootfs following Almaz's guide here: http://forum.doozan.com/read.php?2,13630,page=3. Don't worry about the few minor errors you'll see. Make sure to login to the OMV gui before you reboot the first time so you can enable SSH. The default login is 'admin' and 'openmediavault'. The gui is suprisingly quick. Makes managing multiply disks easier. I'm running OMV along with Webmin and Shairport client (w/USB audio adapter) and the system is still quite responsive. I use a 16GB Sandisk Ultra Fit flash drive as the system disk and have connected an ESATA drive to the Pro's interior sata connector and all is groovy. Next thing to try is a port multiplier to see if it's recognized. I've followed your guide for the Pogoplug E02 and installed the Squeezelite service and one one a LMS. However, I don't know how to do it for a Pro with Debian. While not directly asking for personal tech advice, do you know of a way, or can point me in the right direction to get information so that I can use the Pro as I use the E02? Mostly everything works with my Pro, with the exception of my WiFi. But that's not a major issue. On the second device, this seems to not work on port 4 (the front facing port) but does work on port 3. I don't know much about the platform details, but something doesn't seem right here. Any relevant U-Boot build params (clock related, etc.)? The issue is most likely with the USB HD/Flash drive you're using. Try using one of the tested/recommended drives I have listed. Does this run from the USB drive put on it to install this? I thought it install on it's internel flash. Here is a fdisk -l with a 32GB flash drive on it. So it can see the /dev/mtdblock that I guess is the inside flash drive. Sorry, is it not clear that Debian is installed on the USB flash drive? I have the USB flash/HD drive listed as a requirement and a section titled "Debian Installation on USB Hard/Flash Drive". Thanks so much. Your directions worked great. BUT - now I guess I don't know what I should do. I have a plug running debian and I can ssh in etc. My install in on a 2 GB usb drive. But I am looking for the easy way to setup a home server (I think). Some place I can store movies, pics, music and stream from via my android tablets, ipad, and kodi installs throughout the house. So I installed Samba... and got to a point where it started looking tricky... then read about openmediavault - so I installed that. I got towards the end and got "Errors were encountered while processing: Collectd openmediavault. Okay - so I don't know if I should just continue - because next it says I will loose ssh and have to login via openmediavault and have to enable ssh. Okay - and then - I see that OMV should not be installed on a USB. So... just thinking I should slow down and possibly start over again. Any thoughts? Hi Frank, I'll give you a little hint on my thoughts..
Did I provide a tutorial on openmediavault? Not to say it's bad, just trying to point out it's not something I blogged about. You are correct. Can you point me to the easy Samba answer? I guess I just got into information overload and just ran from one idea to the next everytime I hit a bump. Plus I really like your tutorials since they seem to be written for mere mortals (thank you so much). Note that your harddrive will be sdb and not sda since you mentioned already using a flash drive. Might want to consider installing Debian on the first partition of your hard drive instead of using a separate flash drive. Good luck. I appreciate your help. I know this is a silly question but I just don't want to screw everything up. 2. Reboot my pogo with only the hard drive plugged in and follow the above instructions to get Debian on the hard drive? 3. Follow your Pogoplug V4 instructions starting at the "Install Samba" section? Thanks again Qui for getting me this far. With your help I got it all working now! So - Just in case someone has the same questions I did - I can save you the searching. I was easily able to transfer my install from my USB drive to my external hard drive by cloning the partition with dd. I booted my linux PC and used Gparted to add a small 2GB ext3 partition to the external drive. After 10 minutes it just finished. Rebooted my pogo with only the external hard drive and Bingo - it just works. Is there a tutorial on how to install plex on this? No. If you want Plex, I would suggest another Pogoplug device and going with Arch Linux ARM. Hi again Qui - I have searched all around and you still have some of the best how to guides I have read. So as a followup question - now that I have my Pogoplug booting from my external hard drive and have a seperate storage partition and everything is working fine. Now I am worrying about my hard drive spinning 24 hours a day. Is that something I should just not worry about since it is not writing to it? I have googled a ton of parameters I could play with but don't know if that is wise or wrong? What is your opinion and point me and I will google away. Thanks again for all of your help! It's normal for the drive not to spin down because the OS is constantly writing to logs. Personally, it doesn't bother me. I have debian and would like to change the OS to Archlinux, can someone point me to the directions. Arch Linux is not supported on the Pogoplug Pro/V3 (OXNAS) currently. Check the ARCH linux forum, maybe they will bring back support, maybe not. I got an error while doing the flash_erase. Perhaps I have bad blocks in my flash? I'm using a PogoPlug Pro. I've a problem, during the installation the power went down. After the power was back I wanted to ssh to the pogoplug but I get a time-out error. The pogoplug is seen by the router on the right IP address. How can I restore my pogoplug? 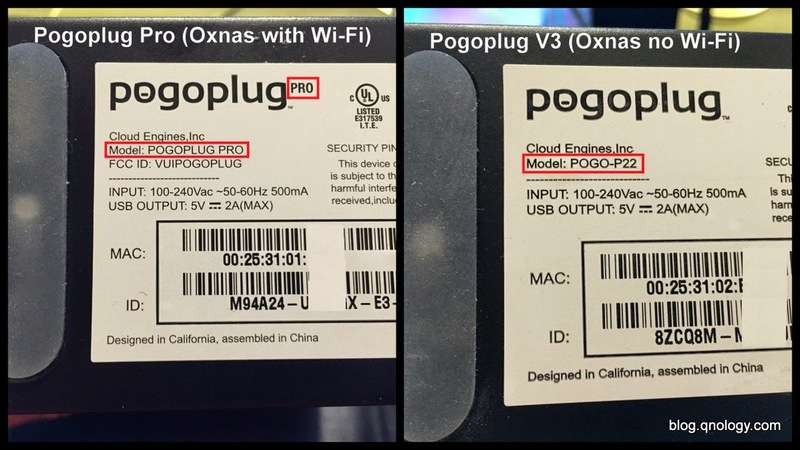 the pogo p01 comes with wifi and interal sata? Are the download links down? I am not able to install uBoot at all. Connection timeout when trying to get the download files. Thank you for letting me know. Should be working now. Sorry, my VPS went down for some reason. I install everything correctly. but when I try to load nothing happened. it says "The connection has timed out"
I saw the DebianPlug on my router with a specific ip address. but I don't get anything. what should I do next? I installed arch Linux to my pogoplug pro which it was still supported, and haven't been used it for quite a while. Is it still OK to follow the above instruction to install Debian on it? Thanks! Hi Qui, I followed your instructions. But at the point where I had to download http://download.qnology.com/pogoplug/oxnas/Debian-3.17.0-oxnas-tld-1-rootfs-bodhi.tar.bz2 using "wget" it took forever and didn't download after many retries. Getting stuck around 32 MB. So I followed the link you posted below to http://forum.doozan.com/read.php?2,16044 link where that link has dropbox link to download linux 4.1.0 tarball. I downloaded that and extracted that instead of 3.17.0 tarball. After reboot, pogoplug is not allowing the ssh. When I ping the IP address of pogo (based on router), I can icmp request responses and then they go away and come back. But I cannot ssh. I believe 4.1.0 was an upgrade on top of 3.17.0 tarball right? What should I do now? then partition is again and download 3.17.0 and extract on it? then plug it back into pogo ? Will that work? I just did what I posted above.. i.e. booted into Ubuntu on my machine, plugged the USB and I was able to read the files I had extracted from Bodhi's 4.1.0 tarball. I also found Dropbox link on Bodhi's site to same Debian 3.17.0 tarball you posted above. but its doing same thing. The ping (icmp) is responding and going away. I think pogo plug is keep on rebooting I believe and not able to boot into USB. I will appreciate if you can respond and help please. Thank you! I see this thru netconsole cat. Sounds like bad USB drive OR something else? Qui, Its working now. Based on error above that it couldn't find /boot/uImage and /boot/uInitrd, I stood up Debian VM and opened up the USB flash again. I extracted the Debian tarball separately in temp folder on Debian and compared the filesystem with USB flash. I was shocked to see that it did not have all the folders and files from tarball. So when I extracted tarball yesterday night, it did not extract everything for some reason and also did not error out. Very weird. Anyways, I just extracted again, loaded the USB and now it started fine. I realized it assigned different IP that what I had put in for fw_setenv ipaddr. But that might be just for netconsole I guess. I'm good now. Thanks for great tutorial. Hopefully my experience and comments will be useful to others. For the mke2fs file, I had to use the url http://fl.us.mirror.archlinuxarm.org/os/pogoplug/mke2fs since the one you gave redirected to an https site, which the wget binary you provided doesn't work with. Are the download.qnology.com links down? I keep getting a connection timeout error. Your VPS might be down again for some reason. will appreciate if you can fix them. Thanks! Anyone had found a working link to the rootfs files? Or an other idea to get my Pogoplug back working? Search the doozan forum for the filenames and you'll find them. Anything I can do about this? It doesn't matter what I plug in. I can try booting from Sata, but I don't have that cable handy at the moment. I've also go another pro that displays a dim blue LED on the board and I get no response from console. I've written this off as a bad flash, but if anyone has advice, I'd be willing to listen. You can get them off of the internet archive using the wayback machine. You could make use of the exact same account on various gadgets Hulu Sign Up View Motion Pictures, TV Reveals, Anime. converts the hardness in the water TopWaterSoftenerCup1 into microscopic crystals. It additionally Water Softener Review 2017 – How To Get Clean Water? has a 7 year guarantee and also Water Softener Review 2017 – How To Get Clean Water? is an amazing choice that will certainly Latest Posts conserve your money as compared to the my response other softeners which call for salt. Today, I like to read about hacking and viruses, these are not just annoying but very dangerous, and how to personally stay diligent to avoid them. Please don’t use same password for all accounts. Use Random Password Generator, This article I hope will be most helpful and provide you valuable insight on keeping your personal information and friends safe! I have seen many posts but your post best.